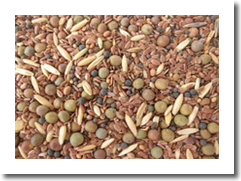 The WCS Garden Cover and Color Mix is a very complex cover crop mix designed for maximum improvement in soil health and nutrient cycling. Use this mix to increase organic matter, penetrate and loosen compacted soil and hardpan layers, increase soil aggregation and aeration, suppress weeds and undesirable insects, and add biotic materials to support microbial life. This mix is winter hardy and will continue growth in the spring. 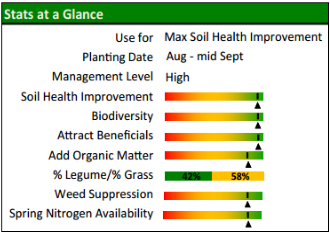 crop to fix nitrogen effectively. We are able to provide replacement packets. 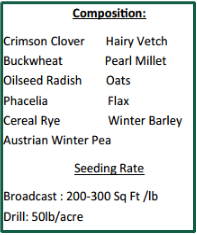 Some of the plants in this mix will winter kill after several days below 30 deg F. The Cereal Rye, Winter Barley, Hairy Vetch and Crimson Clover will survive winter and continue growing in the spring to add a flush of organic material, nitrogen and early blooms for pollinators and beneficial insects. The live plants can be terminated at full bloom stage, approximately mid to late May by mulch mowing, weed whipping, herbicide or tilling. Follow with warm season vegetables.